DON’T SHUCK THAT CORN. There is no easier method, just toss them in an oven. Microwave or regular oven either will do. No husking the corn. Just toss them in. It’s just a matter of setting the timer. 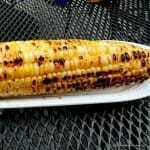 I love my naked grilled corn (char is good). And since sweet corn and grilling season tend to go together, I haven’t had a lot of call for another technique. This spring I have ended up doing more inside cooking than I would like, but it is still “corn season”. For years we cleaned the ears of corn and nuked with a few teaspoons of water in the microwave. It worked fine and was only a little work, but I’m always looking for easier. 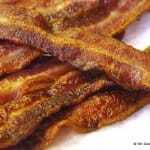 It turns out that you can just toss the ears, husks and all, into the microwave or oven. Cook them and then shuck them. The easiest way to shuck is to cut the bottom of the ear off and squeeze the ear out. The corn silk will stay with the husks. The microwave formula is 4 minutes on high per ear. The oven is 30 minutes total (any number of ears) at 350 for 30 minutes. Remember this, there will be a test later, it’s hard. 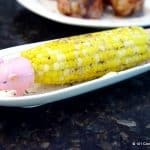 I prefer the grilled corn a bit, but this is just so darn easy that I have been doing them over and over the last two weeks. 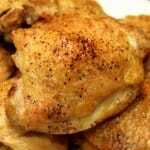 The oven method is great if you’re cooking something else. Just toss them in when you have about 30 minutes to go. The microwave method if you’re moving fast. 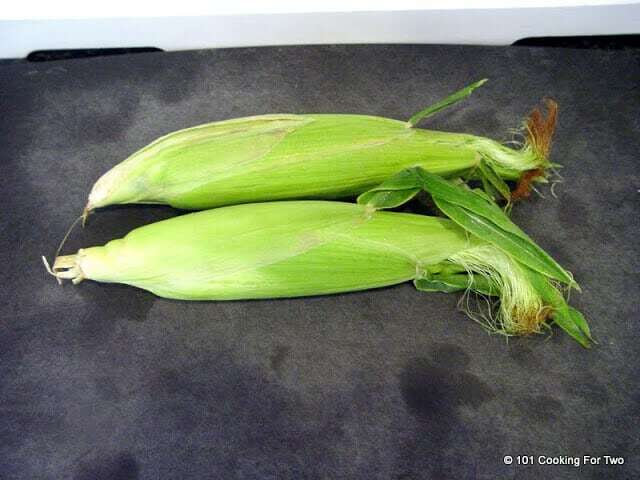 Toss the amount of corn you want in a microwave on high for 4 minutes per ear (2 ears = 8 minutes). Toss them in preheated 350-degree oven for 30 minutes total. As many ears as you want for 30 minutes total. Remove from oven with a hot pad. 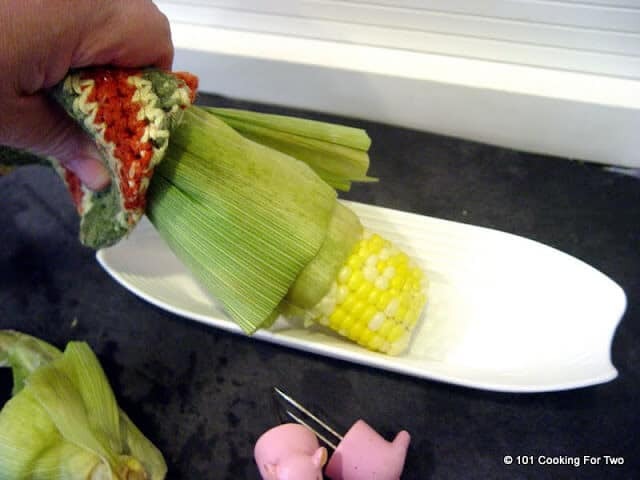 With a SHARP chef knife cut off the bottom of the ear of corn. I take out the bottom row of kernels. 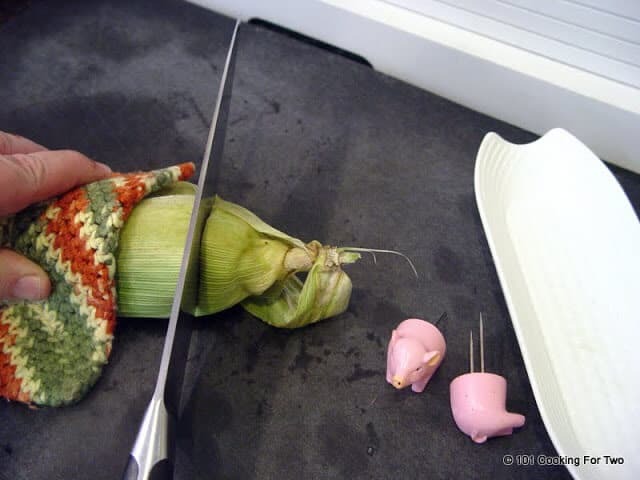 Helpful tip: while you still have the knife in your hand, slide the knife between the ear of corn and the husk and cut a couple of slits in the husk about 1 inch up two sides. The next step will be so much easier. Squeeze the corn out of the husk. 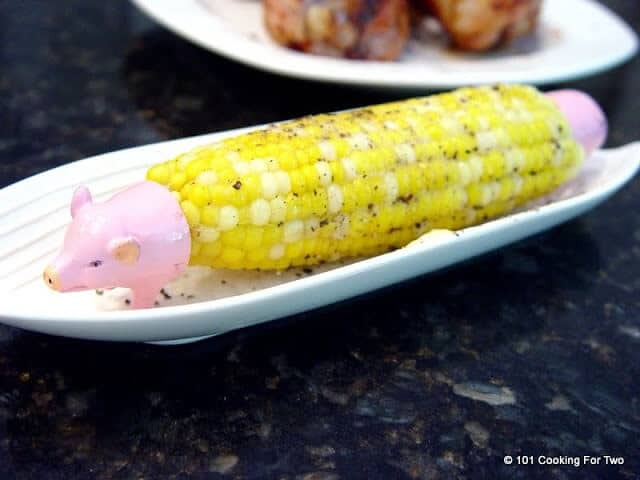 Don’t you love my piggie corn skewers? Mine are “imported from Iowa”. 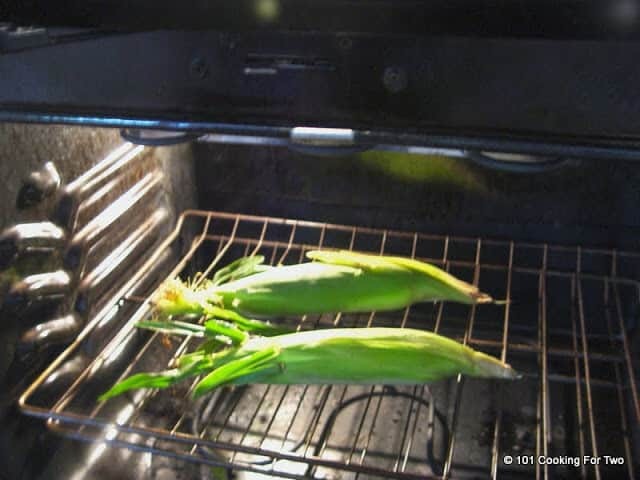 DON'T SHUCK THAT CORN...There is no easier method, just toss them in an oven. Microwave or regular oven either will do. No husking the corn. Just toss them in. It's just a matter of setting the timer. 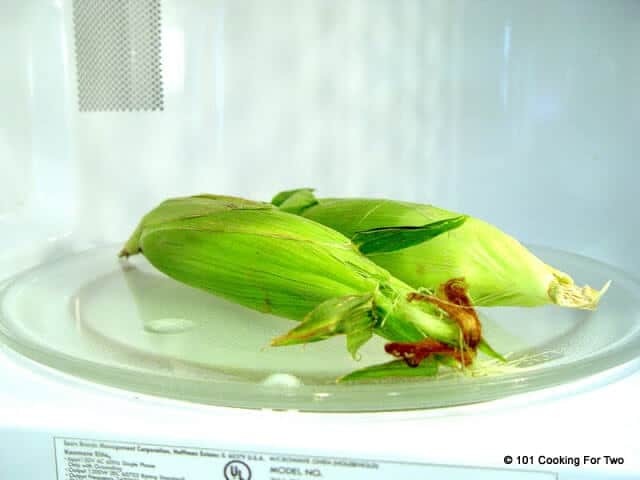 Toss the amount of corn you want in a microwave on high for 4 minutes per ear (2 ears = 8 minutes). 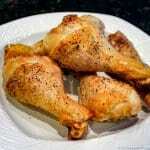 OR Toss them in preheated 350-degree oven for 30 minutes total. As many ears as you want for 30 minutes total. Serve immediately with butter, salt and pepper to taste. A friend recently did the MW version and now swears by it. I haven’t tried it yet but will do it soon. She also gave me a recipe for a corn salad, but it calls for grilled corn. Another one I haven’t tried yet but she assures me it is a tried and true crowd pleaser. I’m glad you gave the source of the cob holders, Alexis wanted them as soon as she saw them.